All horse flies are aggressive and vicious biters, but the bigger ones are particularly menacing. Only the females bite; they require blood meals to be able to produce eggs. When she finds a host, the female uses her sharp, knife-like mouthparts to slash upon a wound in the skin; the mandibles of large horse flies are powerful enough to cut through tanned leather! After opening a wound, the female injects saliva that has anticoagulation properties and she then laps up the free flowing blood. The bite is extremely painful, and blood continues to flow from the wound even after the female finishes feeding. Horse flies have specialized vision that allows them to see heat; they literally use thermal imaging to locate their hosts. The flies are also able to track large moving objects, particularly dark colored objects, even while the flies are in fast flight. Taken together, their visual acuity allows them to effectively zero in on large, savory, warm blooded animals like cows, deer, photographers, and of course, horses. Unfortunately for the flies, dark colored moving cars warmed by the summer sun looks to them like a dark, galloping horse leading to catastrophic consequences ... for the flies ... with the last thing passing through the fly's minds being their rear ends. There are a number of things you can do to keep yourself off the horse fly menu. If possible, avoid horse fly habitat. Their larvae feed on decaying organic matter in moist soil, so horse flies are frequently found in swamps or near streams and ponds. If you can't avoid their habitat, schedule your activities to avoid the flies. 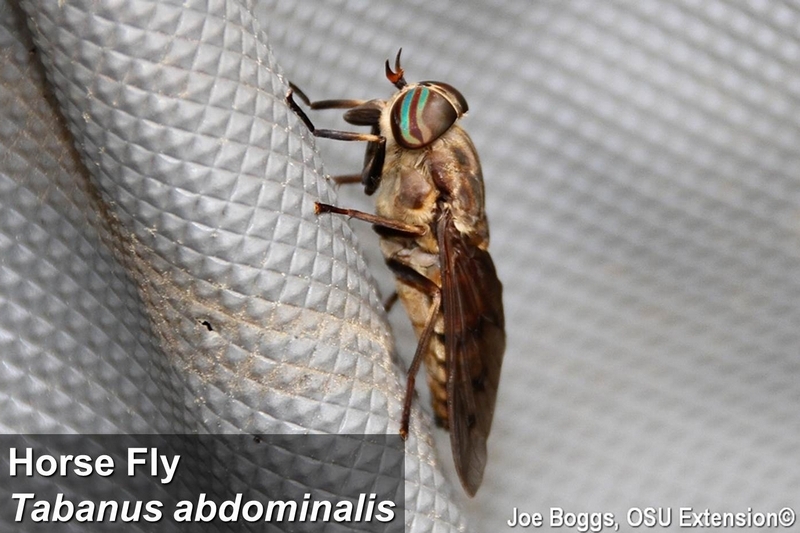 Horse flies are active during the day; they can't find their hosts at night. So, evening pool parties will be free of horse flies. If you must venture into horse fly habitat during the day, remain alert and take precautions. Most flies are silent flyers while horse flies produce a loud, buzzing sound. When you hear the buzz, locate the fly because horse flies love to land stealthily for a quick bite. However, avoid running; remember that horse flies are attracted to moving objects! Wear light clothing; dark clothing is like wearing an "eat here" sign. Finally, while insect repellents that contain DEET or picaridin may provide some protection, horse flies are very good at finding unprotected skin. Long sleeves, long pants, and neckerchiefs can help to thwart the flies.